As Government and press propaganda about the cuts and benefit claimants skews public opinion towards division and hatred, we urgently need to answer back with the actual facts – shaping public opinion until governments and would-be-governments have no choice but to address the damage they are doing. In Actual Fact is a web-based practical resource of actual facts that combat the austerity rhetoric of governments and press. Each fact is short, memorable and instantly tweetable, providing carefully sourced, bite-sized information to call on when answering back. So far we’ve organised mass tweets to counter programmes such as C4’s Benefits Britain 1949, BBC 1’s Britain on the Fiddle, C4’s Benefits Street and C5’s The Big Benefits Row, during the Tory party conference and against IDS’s welfare speech at the ‘Centre for Social Justice’ think tank, as well as in support of the People’s Assembly national Bonfire of Austerity and campaigns such as WOW Petition. In Actual Fact emerged from our Bedding Out project which demonstrated a clear need for a practical resource that would provide a convincing counter to propaganda. In Actual Fact is intuitive one-click activism that is engaging, widely accessible and with the potential for impact. You can tweet occasionally, daily or multiple times each day, making In Actual Fact your browser’s home page as a reminder to keep answering back. You can tweet in direct response to press and television coverage or government statements and join us in a mass tweet (or organise one yourself). 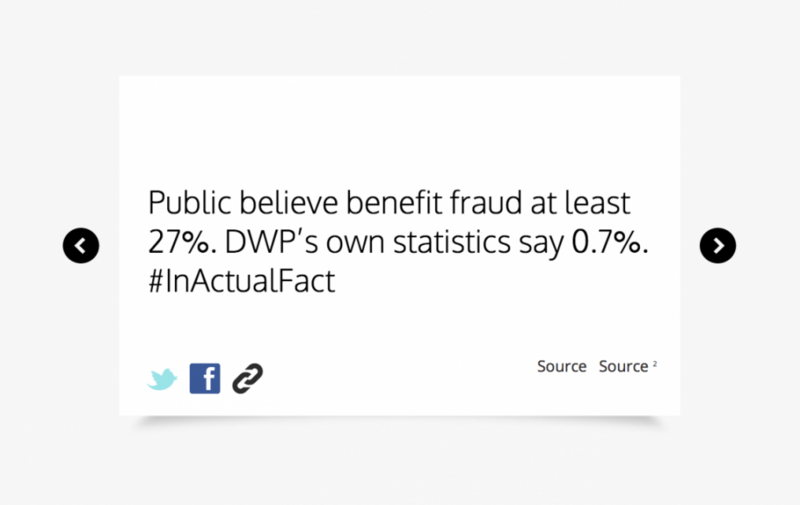 You can also submit your own austerity actual facts via the site. Join us to expose the cost of austerity through actual facts. In Actual Fact operated for two years from http://inactualfact.org.uk/ and @inactualfact101. "For data you can trust"
"You were on fire yesterday with your stats!" "Getting an education reading #InActualFact hashtags"
"This website will make you sad and angry in equal measure. Assuming that you have at least half a soul."